Here is a tribute to the triumvirate of my aerobic upbringing: Joanie, Judi, and Jane — who each influenced me to get into a permanent fitness routine. In the early 80s, these women introduced me to exercise and fitness, and shaped me into who I am today. Joanie Greggains’ long-running show ‘Morning Stretch’ was a big part of my introduction to aerobics in the early 80s. Each show was a fun adventure, with 2 guests (fans) accompanying her. Her vibe was upbeat, often hilarious, and I always learned something beneficial. She was the perfect embodiment of the fit body I continue to aspire to. I met Joanie in person in the mid-80s and was able to tell her how much I owed to her. Joanie is a Bay Area celebrity and still going strong (her age seems to be a closely-guarded secret). Judi Sheppard Missett is the founder of Jazzercise and is thus responsible for getting me hooked on group aerobic exercise classes. Jazzercise had been around since 1970 and was very popular by the time I discovered it in the early 80s. I instantly became a Jazzercise addict. I went to classes at various school auditoriums around town, and when I moved to a new town it was easy to find classes close-by. I was excited that I got to see Judi in person at a Jazzercise marathon in the early 80s at the San Francisco Civic Center — my recollection is hours and hours of Jazzercising by many hundreds of excited females. Afterwards, I was still very hyped-up and Mom took a picture of me in full costume. Jazzercise still attracts loads of exercisers, and Judi (in her mid-70s) is still the CEO. Also in the 1980s, there was Jane Fonda, who inspired me to exercise and is credited with helping start the fitness ‘industry’. 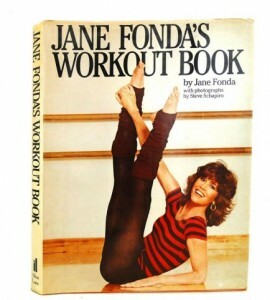 For awhile when I worked in downtown San Francisco, I would go to the Jane Fonda Workout Studio near Union Square, where the classes were excellent, definitely a cut above Jazzercise. I bought Jane Fonda’s Workout Book and also the Jane Fonda Workout record (vinyl), which were effective in getting me to sweat off some lbs. before heading to my Saturday Morning WeightWatchers meeting. Yes, pre-video. Those were the days. Jane is still looking fit in her mid-70s. According to the web, she’s starting to contemplate her mortality: “I have become so wonderfully, terribly aware of time, of how little of it I have left; how much of it is behind me, and everything becomes so precious.” I guess I’ll follow her lead on that, too. Before encountering Joanie, Judi, and Jane, I had never exercised and did not know how to make myself start exercising. I credit them with making fitness an all-consuming pastime/passion for me for more than 3 decades, and for decades to come. Wow. A blast from the past. I used to work out to all these gals. Seems like decades ago. Oh, it was decades ago. Yep! Isn’t it great how these women got so many people up and moving? True fitness mavens.